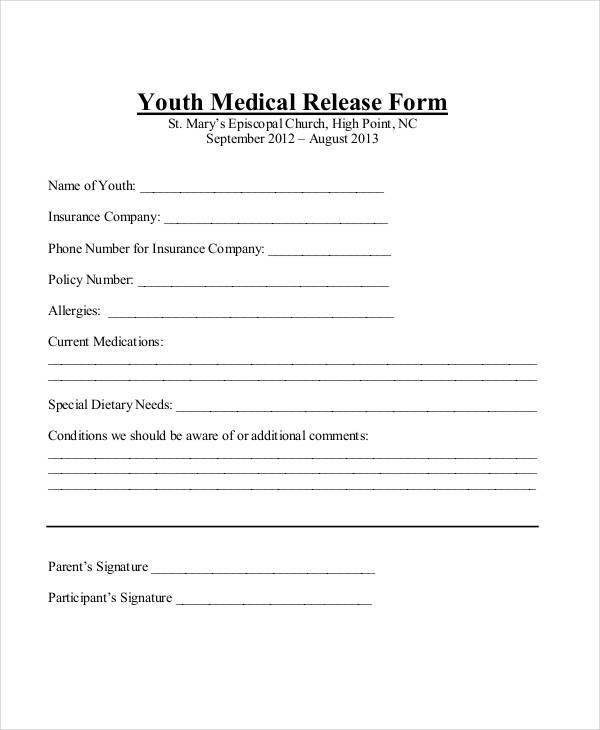 A Medical Release Form is a Release Form that is used for medical purposes. What is a Release Form? It is a legal document that can be used by one company or entity to be signed by another company or entity to release them from any legal liabilities or claims in the future. Any company or organization should have a Release Form on file to protect them prior to performing certain tasks and procedures. This is why we have provided an array of Medical Release Forms on this page. These samples are free to download for your convenience. They are available in PDF format for easier viewing. You can study these samples so that you can use them as a basis for your own Medical Release Forms. 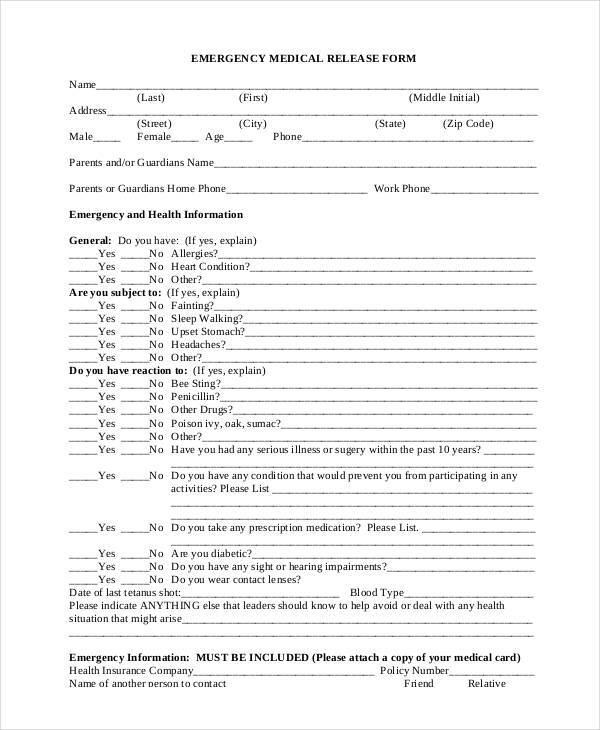 Parties: These are the companies, individuals, or any other entities entering into and signing the Medical Release Form. The entity releasing the other from any future legal liabilities and claims is called the releasor, and the other entity being released is called the releasee. 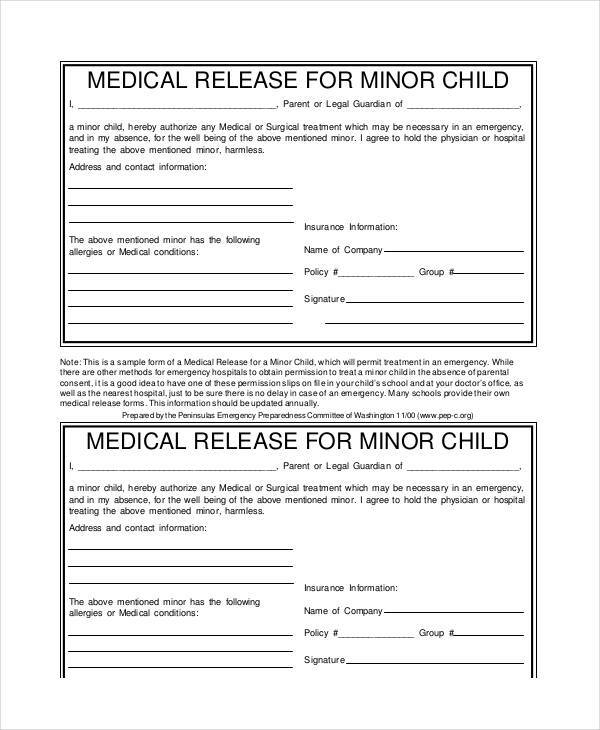 In a Medical Release Form, the usual releasors are patients in a hospital, or the parents or legal guardians of an underage child, and the usual entities being released are hospitals and educational institutions. Release Statement: There has to be an explicit statement of the releasor’s intent to release the releasee from any future legal liabilities and claims. This will attest that the releasor was not coerced or forced in any way, and that he is signing the form on his own volition. 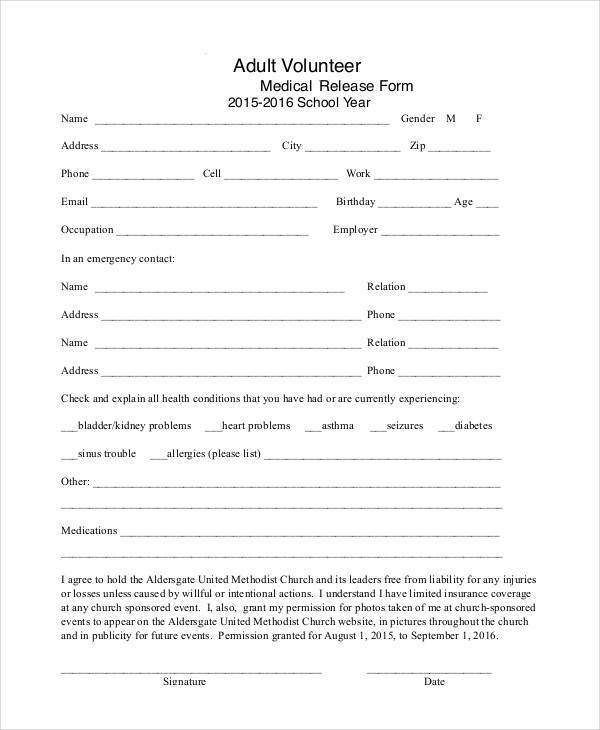 Purpose: The purpose of the creation of the Medical Release Form also has to be specified. 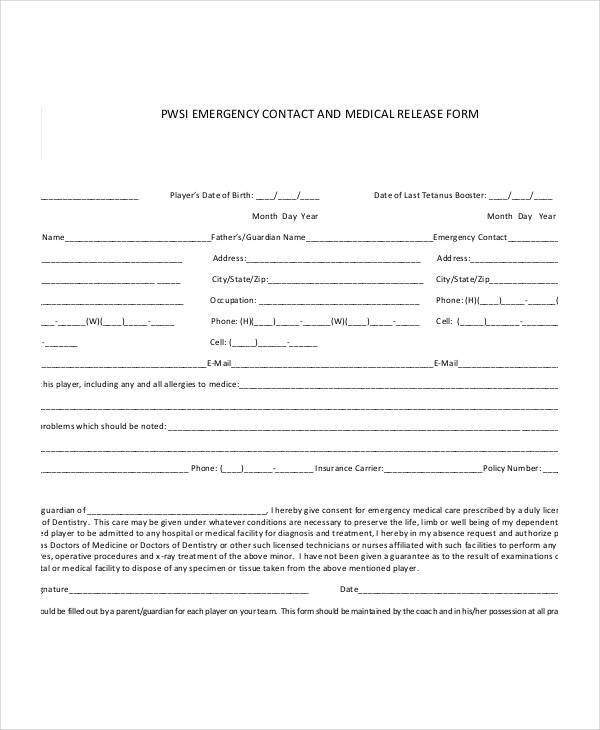 If there are any specifics, like any personal information to distinguish the releasor or any specific information that would relate to the main purpose of the Release Form, then these would also have to be indicated. For example, in a Release of Medical Information or Medical Records Release Form, the type of information that would have to be released should be specified. 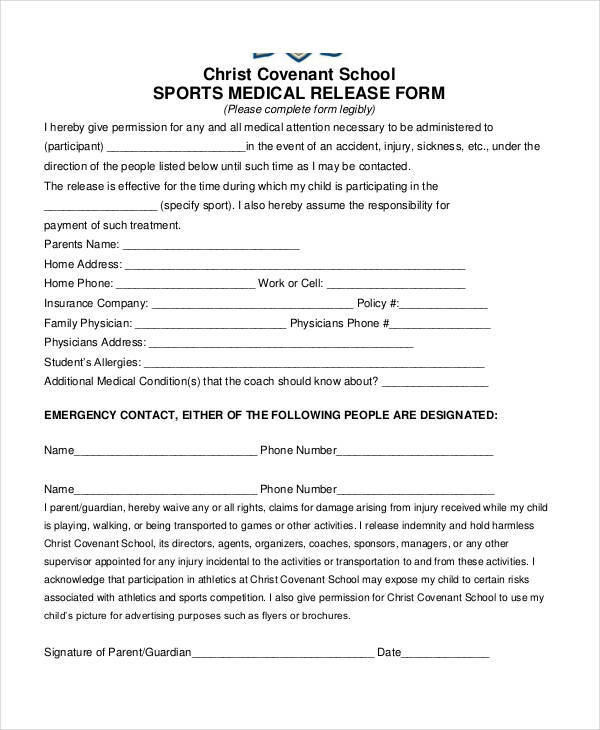 Signature: Like any other legal documents, the signature of the releasor has to be affixed on a Medical Release Form, along with his printed name and the current date. This will solidify the consent provided for the procedure or task. Some release forms are also notarized when necessary, but usually, the releasor’s signature would suffice. 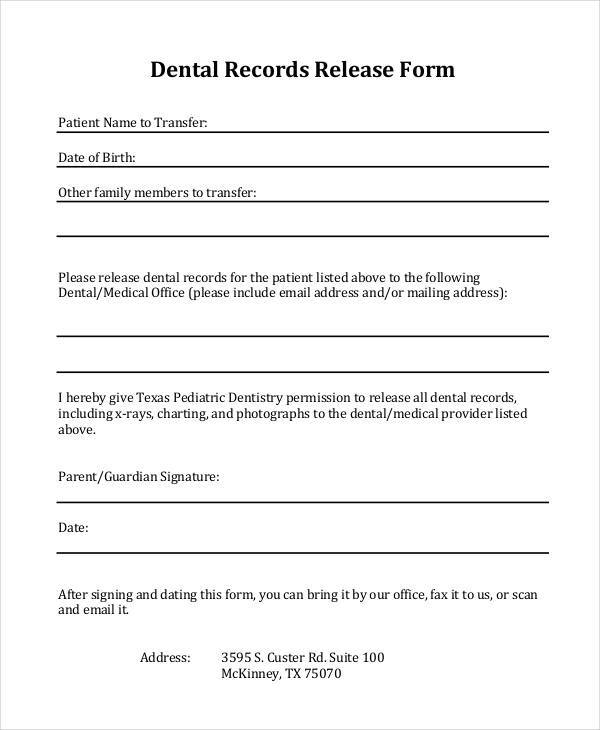 What Makes a Medical Release Form Legally Binding? 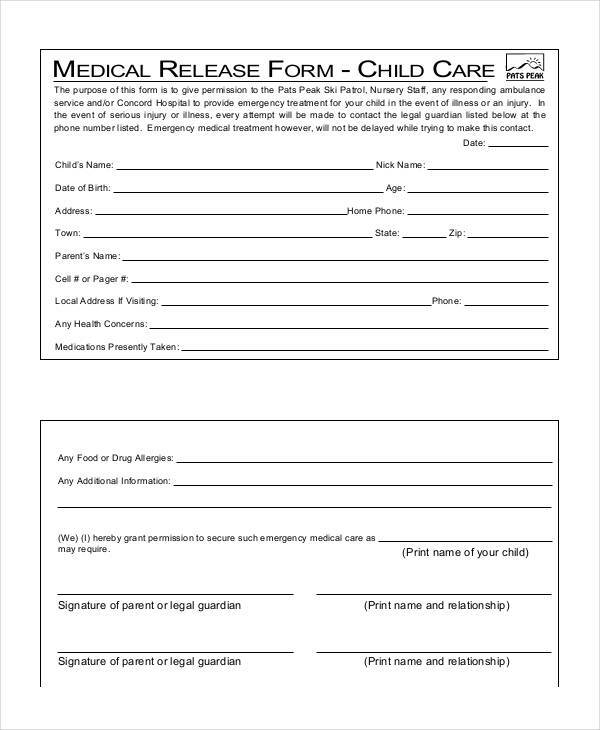 Two of the four parts of a Medical Release Form make it legally binding. That means that it will hold up in court in case of legal action being taken against the releasee. Those two parts are the release statement and the signature of the releasor. These two parts solidify the consent that was provided on the form for the given or stipulated procedure or task. This also means that the releasor fully understands the terms and conditions of the Medical Release Form, and the implication of signing one. 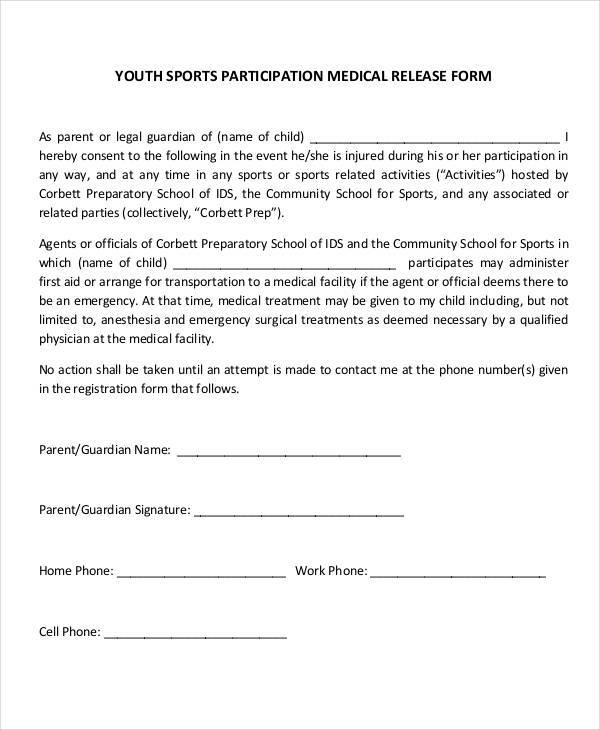 For a Medical Release Form to be legally binding, the releasor signing it should be of legal age and sound mind. That means that he or she is over 18 years of age and is mentally capable of signing a legal document. 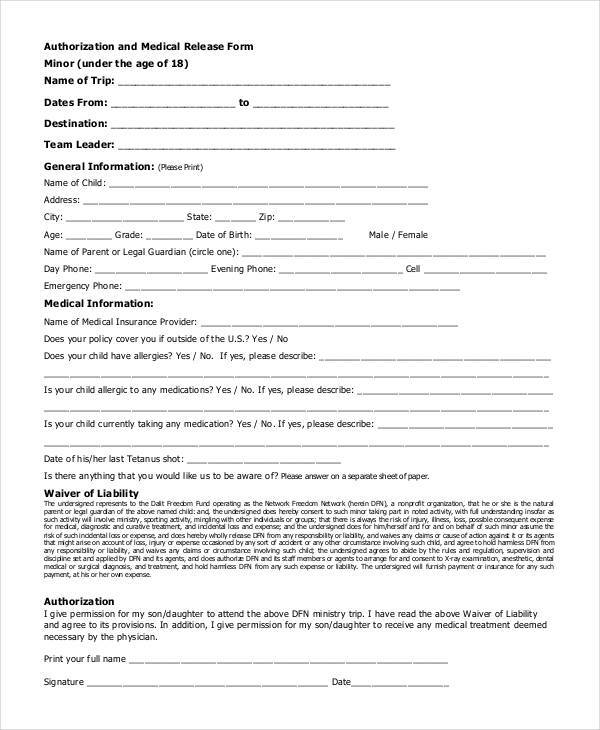 Aside from Medical Release Forms, the use of Medical Authorization Forms are also important prior to a patient undergoing a medical surgery or procedure. This will help the hospital attest that the procedure has been well explained to the patient. This means that any alternative treatment has been presented to the patient, along with the risks and benefits of the medical surgery or procedure he will undergo. 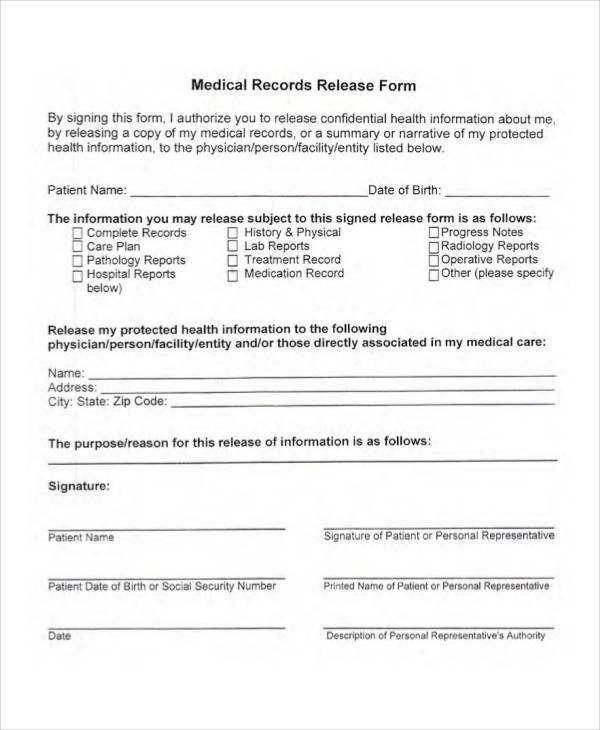 Medical Records Release Forms are release forms used by medical care facilities, such as clinics and hospitals, to be filled out and signed by patients who wish to have their protected medical or health care information released to a specified entity for whatever purpose it may serve. 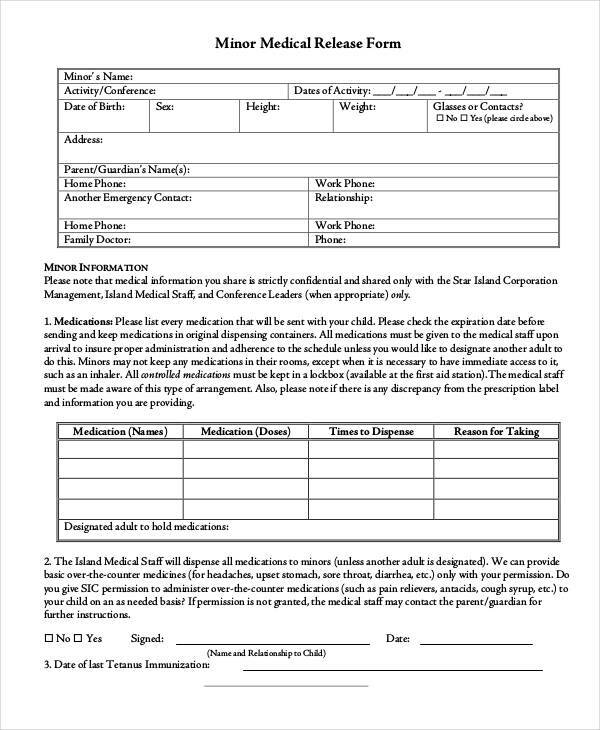 Patient Information Forms also include a portion for patients to sign to provide consent for the medical care facility to release their medical information to their health insurance provider for the purpose of covering the patient’s medical expenses. Medical Records Release Forms are used in accordance with the privacy rule of the HIPAA or Health Insurance Portability and Accountability Act that aims to protect a patient’s protected health information. Because of this, Medical Records Release Forms are also termed as HIPAA Release Forms. 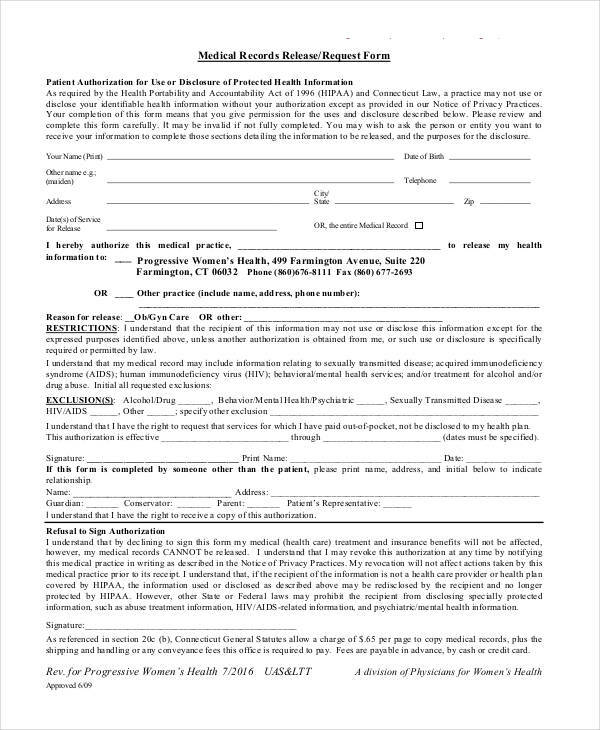 Covered entities, namely medical care facilities, medical insurance providers, and any company that deals with protected patient health information, are not allowed to disclose any of such information to any entity without a written consent or release form signed by the patient. Releasing such information without a written consent is punishable by law and is a violation of a person’s right to privacy. What is Considered to be Protected Health Information? These information cannot be released to any entity without a proper written consent form, but there are a few exceptions. A covered entity may release a patient’s protected health information if required by law to do so, especially to aid law enforcement officials in locating a fugitive, a missing person, or a missing witness. These are basically circumstances that could potentially harm a person or the general public. Another exception is when there is a suspected or potential child abuse case. These are basically instances wherein the health and welfare of a person is considered so much more than that of another person’s privacy, and justly so. 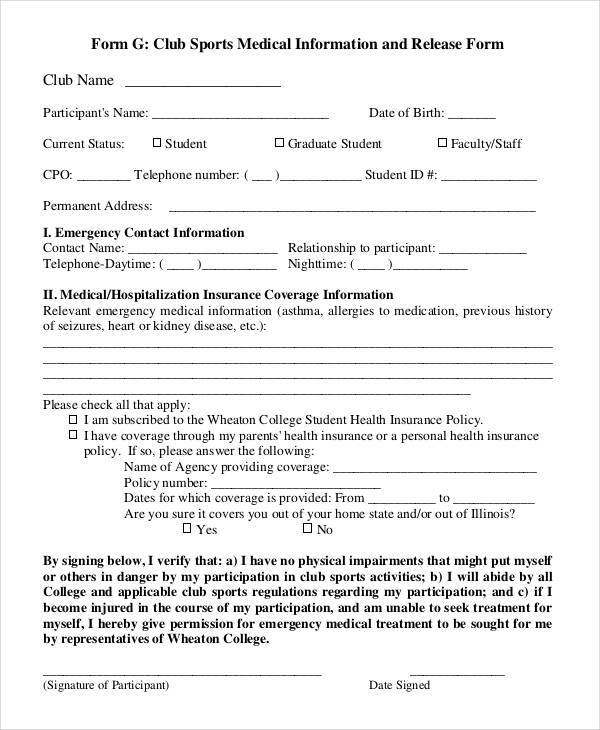 Medical care facilities would let their patients sign a Medical Records Release Form for the purpose of submitting a health insurance claim to their health insurance provider. The patient’s medical information would have to be submitted along with a Health Insurance Claim Form to substantiate the claim. Health Information could also be provided to employers who seek such information to credit sick leaves and other employment benefits. 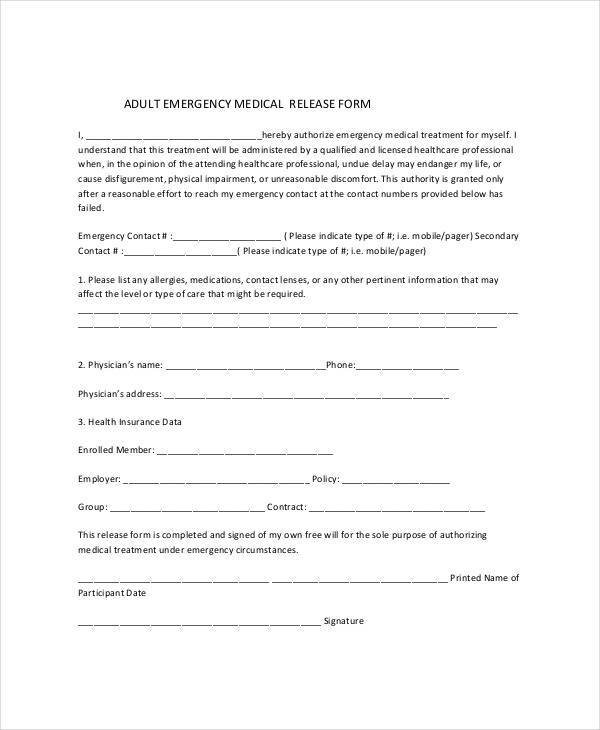 Medical Records Release Forms would also have to be signed for the release of patient’s health information to a receiving medical care facility in case of a transfer or referral of a patient. This is necessary to ensure the patient’s continued care and medical treatment. The patient’s health information gathered by the first medical care facility will be used as basis for continuing his treatment. 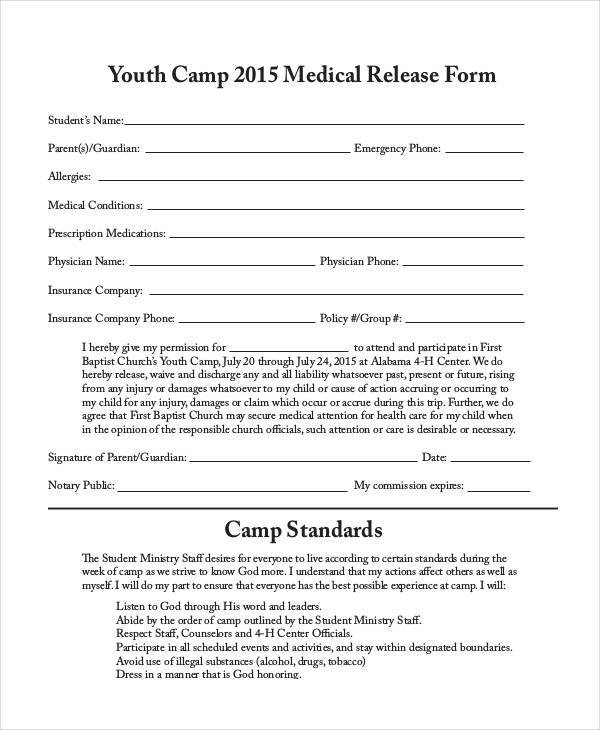 There are also legal circumstances wherein a Medical Records Release Form has to be filled out and signed. Such circumstances include cases of personal injuries and accidents resulting from negligence, and medical malpractice. For these circumstances, a patient’s health records would have to be accessed to understand the whole situation and also to calculate the amount for settlement. 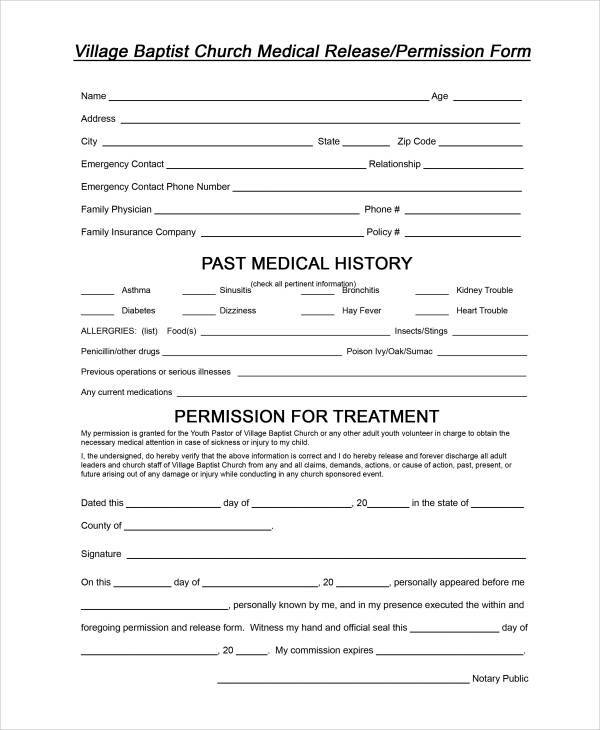 Medical Records Release Forms are also used for medical research studies. Such studies are necessary for the development of modern medicines and vaccines, and the prevention of certain diseases. Researchers for this kind of study would require statistical data to analyze and identify trends, such as identifying the susceptibility of certain groups to a certain disease or medical condition. Another example is finding out how a person’s social history and lifestyle can affect his health or vulnerability to a certain disease. 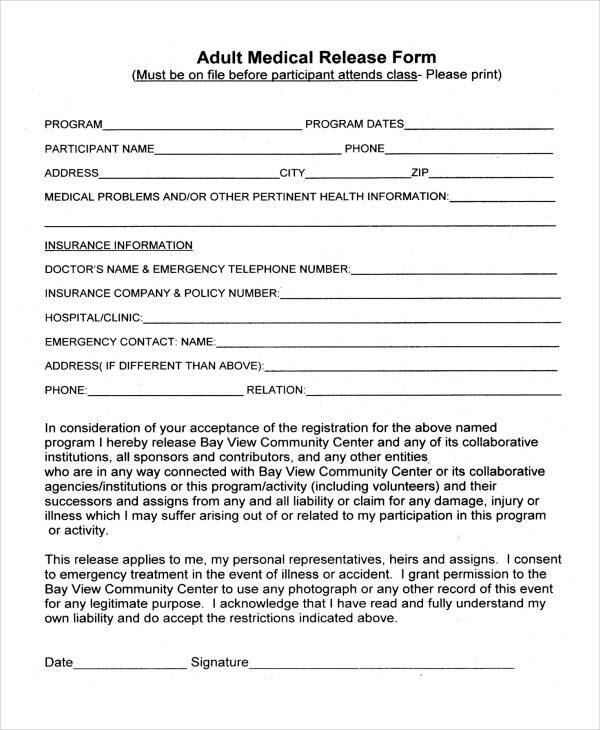 These are Medical Release Forms used during emergencies or to prepare for emergencies. 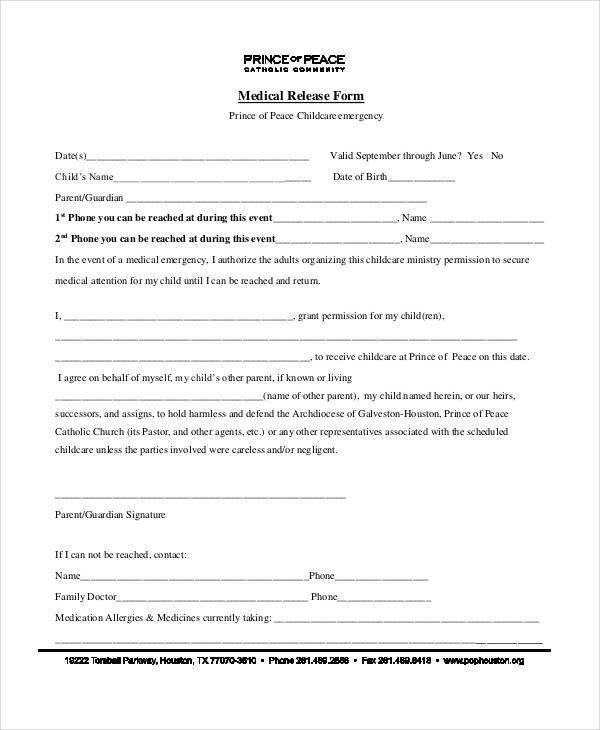 They are mostly signed by parents or legal guardians for the welfare and safety of their children. 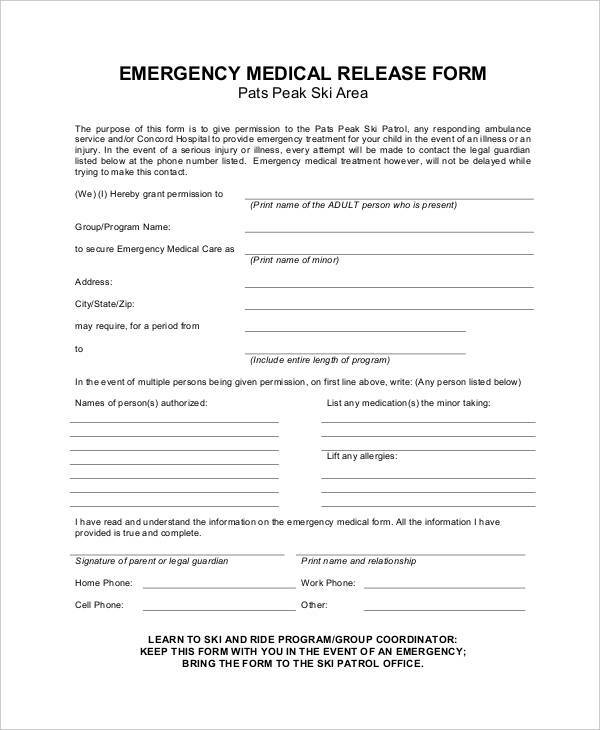 There are many types of Emergency Medical Release Forms for various uses. They come in various formats as well, so as to make sure that all essential information is included. 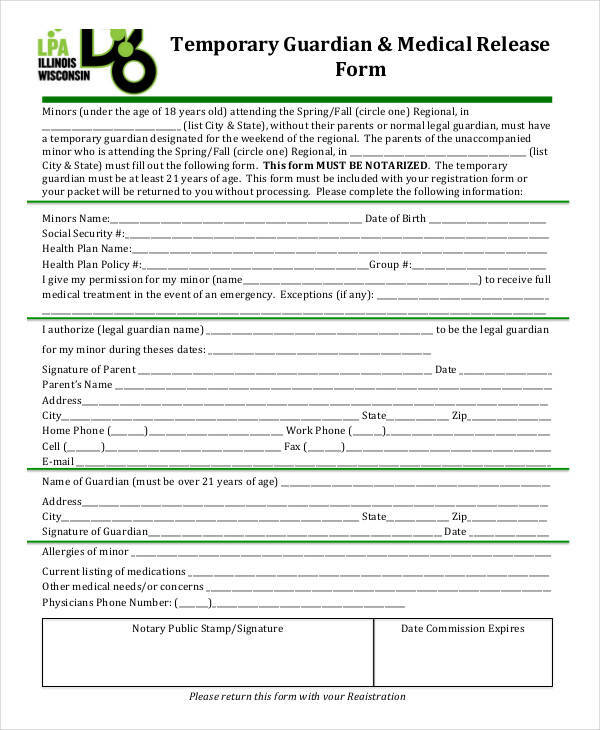 Emergency Drug Release Forms: These forms are used for administering over the counter drugs or medication to minors or underage children to alleviate pain and symptoms for a minor injury or illness, such as headache, fever, or muscle pain. These are especially used during sports events or camping trips. Emergency Blood Release Forms: This is used when releasing blood or blood derivatives for blood transfusions, but without doing a compatibility test first. 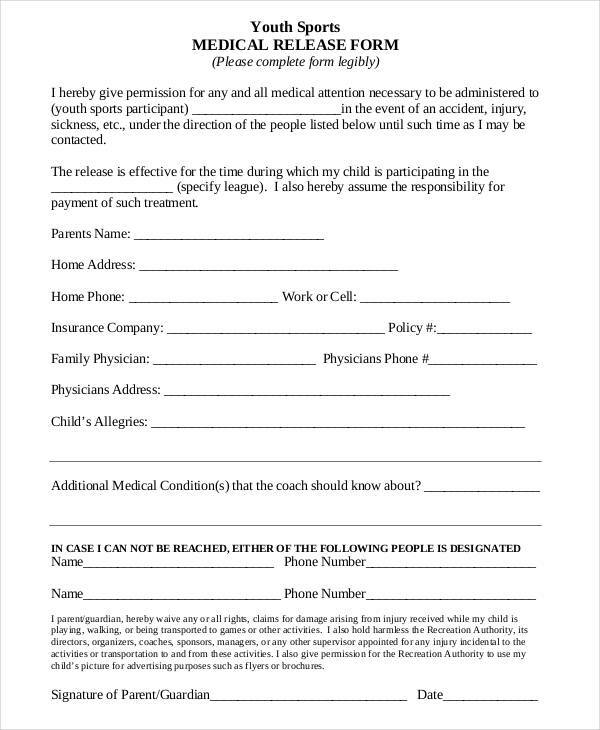 This form has to be signed so that the blood bank will not be held responsible for the release of blood or blood derivatives in such a circumstance. This form will attest that the physician or surgeon understands the risks that entails from transfusing blood without first performing a compatibility test. 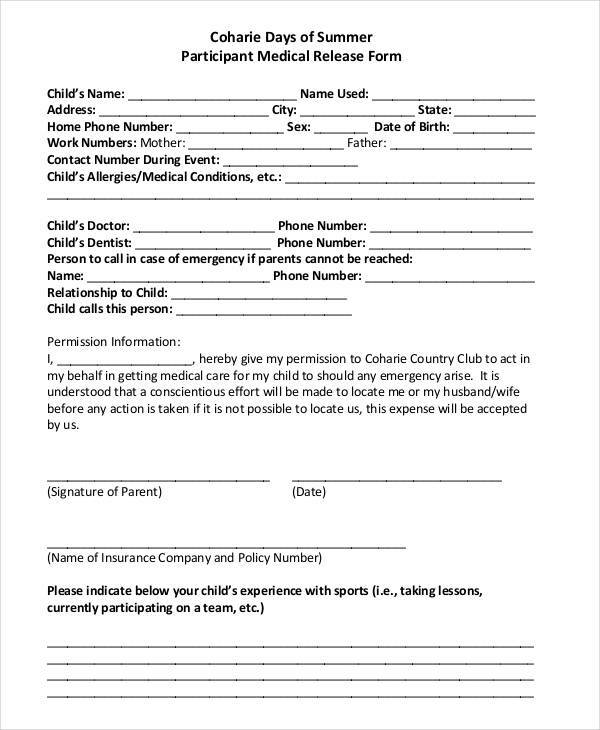 Child Medical Consent Forms: This is the most commonly used Emergency Medical Release Form. 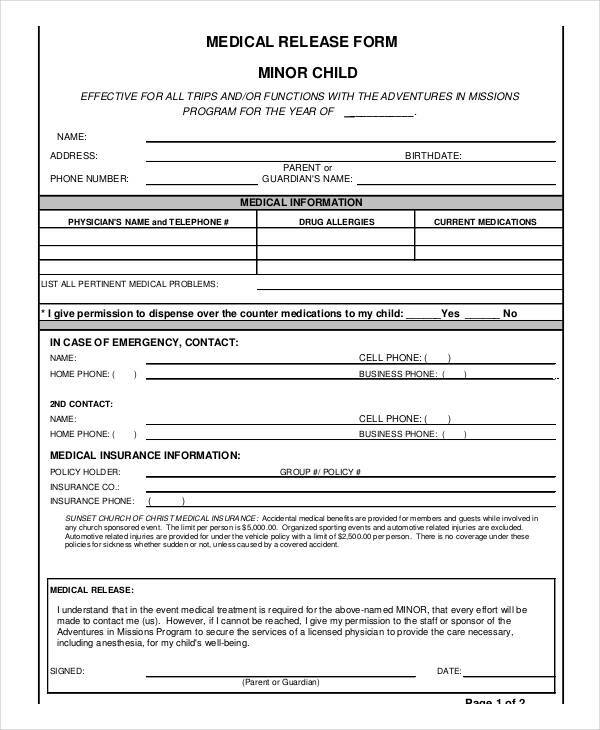 This is used by educational institutions or other applicable organizations to obtain consent from a minor’s parents or legal guardians so that they can facilitate the said minor’s medical treatment in the event of a medical emergency. 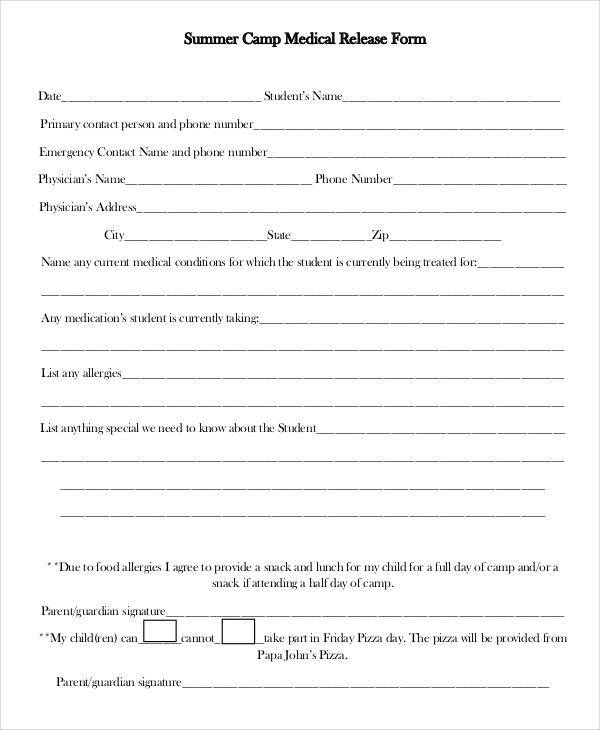 Like Emergency Drug Release Forms, they are also handy during sports events or camping trips, aside from its usual inclusion on a Student Registration Form that are required for admission or enrollment in a school or university.